Good news for the movie crowd: Popcorn actually contains more polyphenols— powerful antioxidants—than many fruits and vegetables. A new study performed at the University of Scranton found that popcorn contains about 300 milligrams of polyphenols per serving, as opposed to the 160mg found in a serving of any kind of fruit. You’ll also take in one gram of fiber for every cup of air-popped popcorn, which packs only six grams of carbs. 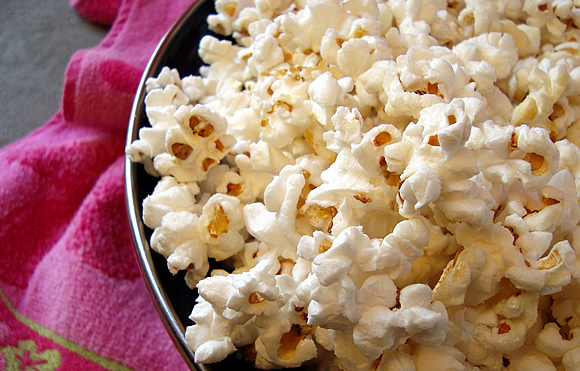 Most varieties of microwave, movie-theater, and kettle popcorn cancel out these health benefits with ungodly amounts of added fat, sodium, and sugar, so prepare your own. If you don’t have an air popper, cook it in a pot with a light amount of vegetable oil. – Air-popped popcorn contains 31 calories per cup. Oil-popped popcorn contains 55. – All popcorn is whole grain, a source of complex carbs. I recognize there is a great deal of spam on this internet site. Do you require aid cleaning them up? I could help in between courses! Popcorn is not very good for your nutrition. No GMO FOODS. Skinny Pop is the best popcorn I have tried. Get a big bag at Costco. Skinny girl is also my favorite.. then .. pop secret 2nd. I am not a huge fan of Orville’s ..its not bad its just that it the popcorn burns even when its still popping like crazy. Weird. I use coconut oil, delish!! I agree that popcorn is good for you but fruits and veggies are a must! Not the microwave popcorn it’s the worst. The chemicals that are used to make it pop. Check it out for yourself. I love it popped in a tiny bit of coconut oil + curry powder + nutritional yeast- DELISH. So addicting though- you’ll try and eat a whole bowl. Hang on here folks! The nutritional benefits of popcorn aside, as it may have higher polyphenols mentioned in this article but the downside is not worth it. Corn as we know it in America is all GMO, or a Genetically Modified Organism and is not the same as even 20 years ago. You basically don’t digest it! Secondly, popcorn is a very rough and ‘sharp’ substance to your small intestine, the place where most of your nutrients are taken into your body. The rough and sharp rip up your intestines causing leaks into your bloodstream which sets off defensive, ‘allergen’ responses that have inflammation as a result. Many, many people that are overweight or obese have inflammatory processes going on that contribute to a whole lot to weight gain. Recommended not to eat popcorn, but if you want to occasionally then please chew it until its liquid in your mouth! Gotta love a movie with popcorn! I Lost 122 Pounds: Caroline Drops The Weight Without Surgery Or Crazy Diets!